Some 70 others were injured in the incident in Bangladesh, many critically. 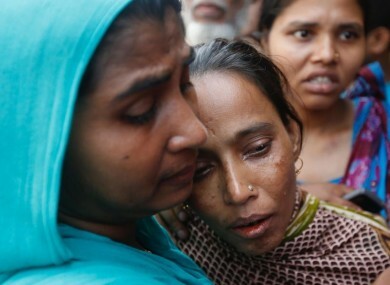 A Bangladeshi woman consoles another woman who lost a relative in the fire. AT LEAST 25 people have been killed and 70 injured, many critically, in a huge fire triggered by a boiler explosion at a Bangladeshi packaging factory, officials said today. Around 100 people were working when flames tore through the four-storey building in the industrial town of Tongi, just north of the capital Dhaka. Parvez Mia, a doctor at the Tongi government hospital, said the death toll was 25 and at least 70 people were injured. The fire started in the boiler room at the Tampaco Foils Limited factory, which supplies foreign and domestic brands. “We still have not controlled the blaze and we fear some workers are still trapped in the factory,” police inspector Aminul Islam said. Mia said seriously injured victims had been sent to hospitals in Dhaka. “Several of them are very critical,” he added. Factory electrician Mohammad Rokon (35) escaped with minor injuries. “I was working inside the office room when I heard an explosion and felt a tremor. Then suddenly the ceiling started to fall on me,” he told AFP from his hospital bed. I almost became unconscious. But I forced myself to go out with the help of my mobile phone’s flashlight. Machine operator Rubel Hossain was two minutes away from entering the factory when the blast occurred. “I heard a huge explosion and saw smoke and fire coming out of the factory. “I am simultaneously feeling lucky and heartbroken,” he said as he helped rush many injured people to hospital. The tragedy struck as families were preparing to celebrate the major Muslim festival of Eid al-Adha. “My brother Delwar Hossain told us last night he would take us to our home district of Sherpur. Now he is going to be buried there,” Khaleda Begum, the sister of a factory worker killed in the accident, said. Chemicals may have been stored on the ground floor of the factory, helping to explain how the blaze that began at 6am (12am Irish time) spread so fast, Tahmidul Islam of Bangladesh’s industrial police unit said. “What we have heard is that there were chemicals stored on the ground floor. As a result, the fire took no time to spread,” Islam said, adding that scores of firefighters were still battling to bring the blaze under control. According to the company’s website, the packaging factory supplies multinational and domestic brands including British-American Tobacco Bangladesh Limited and Nestle Bangladesh Limited. The head of Bangladesh’s factory inspection department said a committee had been set up to investigate the fire. “They’ll probe why the fire occurred and whether the factory lacked proper fire safety measures. They will also suggest how we can improve fire safety of local factories,” Ahmed said. Fires and other accidents are common in the factories that make up the $27 billion (about €23 billion) garment industry in Bangladesh, the world’s second-biggest apparel exporter after China. Western brands subsequently improved safety standards and inspections for suppliers, dramatically reducing incidents of fire and other accidents at export-orientated factories. Fires in garment factories have dropped from 250 in 2012 to just 30 in 2015, with no fatalities that year, according to Bangladesh fire department figures. Email “Firefighters struggle to contain blaze after factory explosion kills at least 25 people”. Feedback on “Firefighters struggle to contain blaze after factory explosion kills at least 25 people”.